We're also teaming up with some 'Nindies' to share some levels from established and highly respected developers such as Image & Form and Choice Provisions. 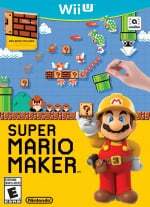 While Super Mario Maker makes us all game creators, we think it can be interesting to take a look at levels from those within the development community so we can understand the thought processes behind their designs. While many of us will slap down items in Super Mario Maker in a haphazard way and tweak them on the fly to make something fun, a level designer may well approach things in a more methodical fashion. This time its the turn of Curve Digital's Hamish Lockwood and Kevin Laughlin. Will their experience in developing Stealth Inc 2: A Game of Clones and other indie classics help them to create the ultimate Super Mario Maker level? Below you can check out the levels and learn more as Hamish and Kevin talk over their designs. A cunning ghost house level where you'll need sharp eyes to escape. Are you going round in circles or going insane? What was the process behind the creation of your level? Ham: Déjà Boo, great pun name. Kev: Thanks, I thought of that just as I was uploading it as well. I had to get that in there. Ham: That is a requirement at Curve, to have pun names for your levels. Kev: Yeah, even for other people's games. 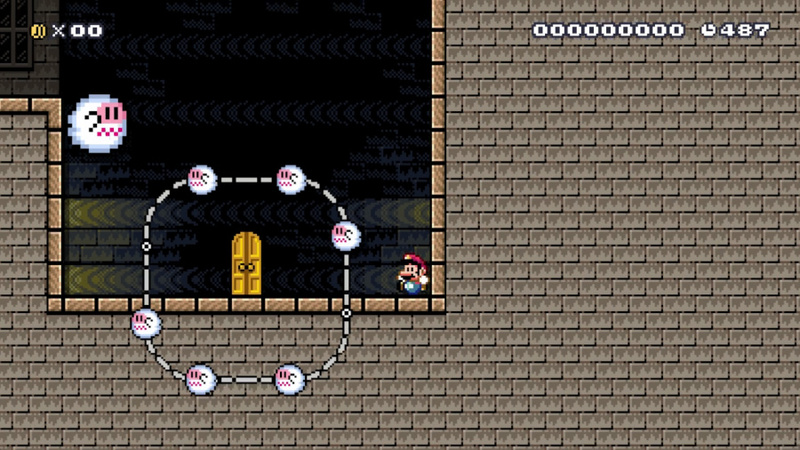 Kev: Yeah so I wanted to do a sort of puzzley level and I thought the ghost tile set would work well for that because they're usually puzzles in the Mario games. Ham: I suppose players will expect a puzzle with that tile set. Kev: You expect something different when you get onto them. And they're usually based on loops as well, so you're sort of going around in circles until you figure it out. So yeah I tried to do something with that. Ham: They are also sometimes a little bit confusing I find. But I didn't get confused with yours, which was pretty sweet. Kev: I tried to make it that way – it's quite a short level which probably helps it not be too confusing. Ham: Yeah, and then it's also, I think the process of solving it is you get to a point where you realise it's a loop and then what you naturally try begins to reveal the solution. Then once you figure that out it's just a case of you knowing what you have to do but you just need to find the right solution… It's hard to describe without wanting to give much away! But yeah, I think it worked really well. Kev: Thanks! With puzzles it's hard to tell where the balance is between people seeing the solution straight away, having a satisfying challenge, and making it too obscure, which is why playtesting is so important for commercial games. But having a puzzle that is a loop means there can be an obvious path and a non-obvious path which has the solution, and if you don't find the solution first time you aren't just standing in the same room looking around. A level set in the precarious skies of Super Mario Bros. 3, that turns the helpful P-Switch into a land mine you'll want to avoid at all costs! With puzzle elements thrown in too, this level will test your wits and your platforming skills! Ham: With The Ol' P-Switcheroo, my original goal was to have just a pure platforming level with no puzzle elements. 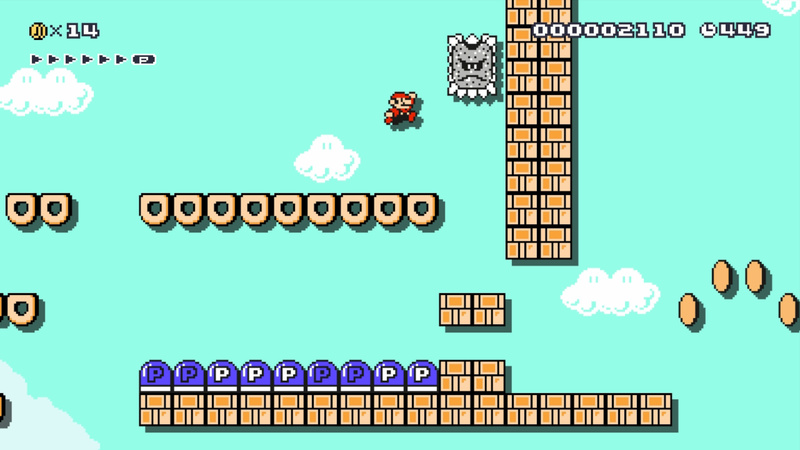 I had an idea of having a level set up in the sky with lots of blocks and then taking the P-Switches that are normally helpful to you but then turning them into something you want to avoid the whole way through. So I just had a very simple thing at the start where you just jump along the blocks until you see one, and then most people are going to know what a P-Switch is but just in case… It's almost like, it's not a tutorial but it's a chance to press a switch and see what's going to happen… It's creating an expectation so when you go through the rest of the level you know that's going to mess you up. Kev: Yeah, that's a good twist on what it usually does. Ham: Yeah, well that's kind of the cool thing with Mario Maker is you can do stuff that wouldn't normally go in a regular Mario game, which is quite cool. So yeah, I made a few little self-contained stretches of level floating up in the sky and I would play with those and when they were working I would move onto another one and then when I had a few I would choose the best and string them together so they formed a level. I played through that a few times so I could polish it up a bit and make it feel more cohesive. But I guess the process would be to find a theme, which was the P-Switch in the sky, introduce that and expand on that. Then put a little twist on it to add something new to theme which was the Thwomp, and that turned out to be a small puzzle which I didn't intend to include. It all just naturally evolves from the initial theme you choose. Ham: Well initially I wanted to have enemies that fell down from somewhere and trigger the P-Switch but they just fall in front of the switches so it's interesting that some things do activate it and others don't. So if the Thwomps didn't do it the level probably wouldn't have been as interesting. Kev: It's good to experiment and see what kind of interesting mechanics come about from combining two things that don't normally appear together. Ham: It's cool that a lot of entities do interact with other things in unexpected ways because I think that's how you find interesting moments to make levels with and surprise the player, which is always what you want to aim for. How have your experiences designing levels at Curve Digital helped/hindered you in the process? Kev: Well one big difference is that Mario Maker doesn't give you checkpoints. Kev: So you can't… Like in Stealth Inc. we could surprise the player by killing them, like if they mess something up. Ham: Yeah, you could make a trap but know that trap is going to kill them so you checkpoint just before so they don't get punished for it. Kev: …because if you had to redo the whole level again that would be really frustrating. But you can't really do that in a Mario Maker level because there are no checkpoints so you have to be more fair. Ham: I found myself being more lenient with the difficulty, and in fact in the first level I made I realised that was happening as I was making it, so the level started off hard and then got easier which is kind of backwards really, but you don't want them to get through a long level and then die at the very end which is the hardest part, or naturally feels like it should be the hardest part, because that would feel unfair. I dunno, it feels kind of strange but I can see why they would exclude checkpoints because that would break everything really. Kev: So you have to surprise the player in other ways that don't kill them. Ham: Yep. Which is a hard thing to do. Kev: It's a hard thing to do when you're used to doing exactly that in Stealth Inc. So yeah it hindered in that way. Ham: Yep, I found myself wanting to put in loads of traps as well, just because that's what I'm used to doing for the last two years or whatever. Which again is the cool thing about Mario Maker – you've got a chance to make stuff that don't feel like Mario levels necessarily which is really nice. Obviously we're seeing that in the community – lots of weird things, which is pretty awesome. Be sure to try out Hamish and Kevin's Super Mario Maker levels for yourself and let us know what you think with a comment below. Do you feel their design choices paid off? Son of a... I swear I have a level saved, but not uploaded right now where the key to getting through the level is manipulating Thwomps to activate P-Switches. Better upload it before the professional game makers' levels get more popular than mine due to things like better press coverage and/or level design. This idea is genius - they should figure out a way to make more of these Indie Mario Levels happen - given there are no slants/slopes in Mario Maker - this might give me a reason to get it! @vitalemrecords The lack of slopes is the only thing keeping you from the game? @QBertFarnsworth - "Better upload it before the professional game makers' levels get more popular than mine due to things like better press coverage and/or level design." A little bit of merit won't go as far as a lot of publicity. The "Star" system has turned Mario Maker into a popularity contest. These particular levels look pretty good, and I especially like that the end of Ham's level forces players to do something they expect is bad, only to experience a reversal of fortune. It actually reminds me of Thomas Was Alone. But most of the time, people have been getting rewarded for being well-known personalities in the online gaming community, rather than making the types of levels that might actually be fun to play. * There is a lot to criticize in the top starred levels of all time. For example, Rubber Ross from Game Grumps has over 5000 stars as of last night for a troll level called "very simple" that would have taken minimal effort to create and play-test. I'm not saying it's a terrible level, but it's definitely not for me. And more to the point, if I had made that level, it would have gotten nowhere. I felt cheated when I died. If Ham's level gets half as many stars as "very simple", I'll be surprised. But they'll all be well deserved stars in my opinion. *disclaimer: what is fun for some is not fun for others. I beat the Deja Boo one in my first try. It was so obvious what you had to do it hurt. Hello there fellow Nintendolifers my name is Julyo and I am here to look at the best levels that are made from people like you and me so that we can band together and take over the automatic levels, and others! So if you care to join me over my Youtube channel and posts your code in the video comment section so that I can rank them just like last week's top 10! Ok I've played both levels. Déjà Boo is very simple, the idea is good but the execution didn't result as satisfying for me, I think it needs to be a little more confusing in order to make the players feel at least a little lost and get that great feeling after they realize what to do. I liked The Ol' P Switcheroo more. It's a good concept and the platforming is really nice. The thwomps add little puzzles to the level that are satisfying to solve. And the end is great! I am loving the sheer amount of content in this game and at this rate it will be my most played Mario game of all-time and whenever I want some Mario platforming action I know exactly where I will be going. I still enjoy the original Mario games but after playing this game and seeing the cool ideas players have been putting in their levels I think Nintendo will have to step it up to keep me interested in a core Mario title. I'll try these levels if I remember, but I was just wondering: Ham said that checkpoints would 'break everything', but I don't really see what the problem is with checkpoints?